Two Ontario sisters are making an emotional plea to whoever may be in possession of their mother’s ashes. They believe an urn containing her remains was removed from their elderly father’s Pembroke home on Saturday by people invited inside to look at furniture they put up for sale. Tammy Guimond-Thomas and Kelly Guimond-Huckabone say the precious keepsake was part of a memorial on their 82-year-old father’s mantle. About two years ago, a sudden heart attack killed his wife of nearly 51 years. Most of her ashes were interred at an Ottawa cemetery. Her husband and three daughters kept some of the remains in small egg-sized urns they could place in their homes. Losing one has been devastating. The sisters said close to 100 people attended the sale, and many were guided through the house to look at items too large to move outside. The loss has amplified the anguish of what was already an emotionally-charged weekend as they start to say goodbye to their family home. The daughters recently put the house on the market after deciding their father should move in with one of them. Guimond-Thomas said her nephew and grandfather first noticed the urn was missing. The family is not sure if it was stolen or taken by mistake. They just want their mother’s ashes back. “We’re not interested in pressing charges. There are no legal ramifications. We just want her returned safely so she can be with us and my dad,” Guimond-Thomas said. The family has reported the missing urn to the police and pleaded for its return in a Facebook post. Guimond-Thomas said she is worried about how her father is handling the loss. He has taken to checking the mailbox several times a day in the hopes that someone returned the remains anonymously, she said. 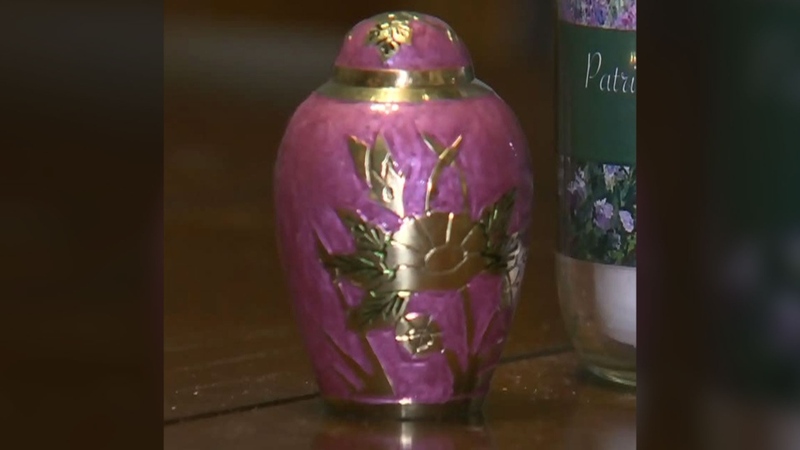 If the missing urn is not returned, the sisters said they plan to empty some of their ashes into a new one for their father. They’re still holding out hope that someone will reunite them with what they lost.